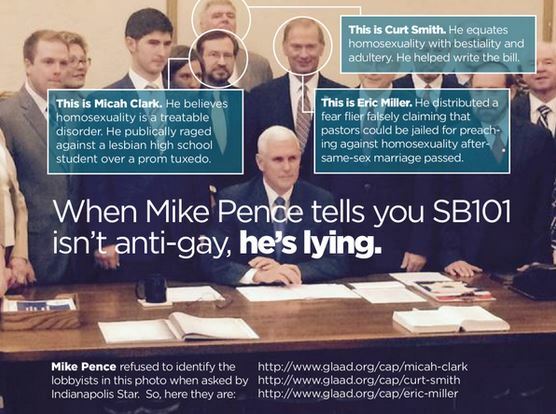 INDIANA LAW = TURNS DISCRIMINATION UPSIDE DOWN = FREEDOM TO DISCRIMINATE | Concise Politics -- Your Time should NOT be wasted. Indiana Law = TAKES ALL BURDER OF PROOF OFF THE PERPETRATOR OF RACISM, SEXISM, AND DISCRIMINATION AND PUTS ALL BURDEN OF PROOF ON GOVERNMENT TO DEFEND ITSELF FOR ENFORCING THE LAW! MAKES IT COSTLY AND NEARLY IMPOSSIBLE TO ENFORCE DISTRIMINATION LAWS! “Establishment Clause” = Part of First Amendment of the Constitution of the United States or the Constitution of the State of Indiana prohibiting laws respecting the establishment of religion. “Granting” = Government funding, benefits, or exemptions, does not include the denial of government funding, benefits, or exemptions. “demonstrates” = Meets the burdens of going forward with the evidence and of persuasion. “exercise of religion” = Any exercise of religion, whether or not compelled by, or central to, a system of religious belief. “governmental entity” = Includes whole or any part of a branch, department, agency, instrumentality, official, or other individual or entity acting under color of law of any of the following = State government + A political subdivision + Instrumentality of a governmental entity + state educational institution + Body politic + Body corporate and politic + Any other similar entity established by law. Any entity = May sue and be sued + Exercises practices that are compelled or limited by a system of religious belief held by = Individual + Individuals who have control and substantial ownership of the entity = Operated for profit or nonprofit purposes. Governmental entity = May substantially burden a person’s exercise of religion only if the governmental entity demonstrates that application of the burden to the person: (1) is in furtherance of a compelling governmental interest; and (2) is the least restrictive means of furthering that compelling governmental interest. SUE GOVERNMENT = If the relevant governmental entity is not a party to the proceeding, the governmental entity has an unconditional right to intervene in order to respond to the person’s invocation of this chapter. SUING COSTS GO TO LOSER = MAKES GOVERNMENT THE DEFENDENT: If a court or other tribunal in which a violation of this chapter is asserted in conformity with section 9 of this chapter determines that: (1) the person’s exercise of religion has been substantially burdened, or is likely to be substantially burdened; and (2) the governmental entity imposing the burden has not demonstrated that application of the burden to the person: (A) is in furtherance of a compelling governmental interest; and (B) is the least restrictive means of furthering that compelling governmental interest; the court or other tribunal shall allow a defense against any party and shall grant appropriate relief against the governmental entity. (b) Relief against the governmental entity may include any of the following: (1) Declaratory relief or an injunction or mandate that prevents, restrains, corrects, or abates the violation of this chapter. (2) Compensatory damages. (c) In the appropriate case,the court or other tribunal also may award all or part of the costs of litigation, including reasonable attorney’s fees, to a person that prevails against the governmental entity under this chapter. CANNOT SUE ANY NON-GOV ENTITIES UNDER THIS LAW: This chapter is not intended to, and shall not be construed or interpreted to, create a claim or private cause of action against any private employer by any applicant, employee, or former employee. This entry was posted in INDIANA LAW = TURNS DISCRIMINATION UPSIDE DOWN = FREEDOM TO DISCRIMINATE and tagged INDIANA LAW = TURNS DISCRIMINATION UPSIDE DOWN = FREEDOM TO DISCRIMINATE. Bookmark the permalink.